SEATTLE— The National Marine Fisheries Service announced today that it intends to expand critical habitat protections along the West Coast for endangered “Southern Resident” killer whales. The finding, which says a decision will be made in 2017, comes in response to a petition by the Center for Biological Diversity seeking to extend Endangered Species Act protection to the whales’ winter foraging range off the coasts of Washington, Oregon and California. 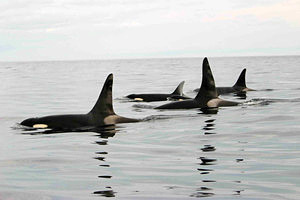 After several drastic declines, only 81 killer whales remain in the Southern Resident population. “Killer whales are at a crossroads, and protecting their foraging habitat along the West Coast will be essential to their recovery,” said Miyoko Sakashita, the Center’s oceans director. In response to a petition from the Center and allies, the Fisheries Service determined in 2005 that Southern Residents are in danger of extinction. Although the agency has protected portions of the population’s summer habitat in the Puget Sound (about 2,500 square miles), some 9,000 square miles of important offshore habitat areas have recently been documented. The whales travel extensively along the West Coast during the winter and early spring, regularly congregating near coastal rivers to feed on migrating salmon. The Center’s petition sought to protect these areas off the coasts of Washington, Oregon and California as critical habitat (see map). While today’s finding indicates that the Fisheries Service intends to proceed with a revised critical habitat designation, it also will delay proposing a rule until 2017 to gather more information. “Killer whales need new habitat protections to prevent ocean pollution and noise that can interfere with their ability to locate prey. While the Fisheries Service’s announcement is an important step forward, time is of the essence, and those new habitat protections are needed now,” said Sakashita. Human activities in and near coastal waters threaten these whales by reducing salmon numbers, generating toxic pollution and increasing ocean noise, which disrupts the orcas’ ability to communicate and locate prey. Critical habitat designations prevent the federal government from undertaking or approving activities that reduce an area’s ability to support an endangered species. Studies show that species with designated critical habitat are more than twice as likely to be recovering as those without it.